The C-Tec NCP-12 is a replacement pull chord for a call system ceiling pull unit. 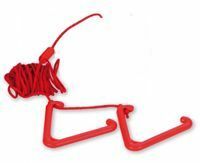 This product is manufactured by C-Tec and comes supplied with a 3m chord, 2 triangles and a bullet. These pull chords are ideal for use with the C-Tec 800 Series and Quantec Call System Ceiling Pull units. This product is available to buy for only £3.95 ex VAT. In addition to the C-Tec NCP-12 Pull Chord we can also supply the full range of C-Tec 800 Series and the Quantec Series call system equipment. C-Tec are a UK based manufacturer of high quality fire safety products. Their systems are used in many buildings throughout the UK and also worldwide. They also manufacture a range of Disabled Refuge Systems which are currently in use in many prestigious buildings throughout the UK. If you’re interested in C-Tec NCP-12 Pull Chords you may also be interested in C-Tec Disabled Refuge Systems and C-Tec CFP Panels.